Though there are lots of ways to make a document available for commenting online, I’ve still not seen anything as effective as the use of a slightly hacked blog in allowing the public to get into the detail of a document. A few years ago, the Power Enquiry made it’s findings available in this way. Last week, after the Digital Britain report was published (and criticised for not having been very consultative in it’s origins, a blogger put it online in a commentable way. The best example I’ve seen in terms of an attractive interface and a useable design also was published in the last week or so – the Power of Information Taskforce report – done by a group of people who have really lived with this way of discussing policy documents for a long time now. Slugger O’Toole editor Mick Fealty and I had planned to do something about the Eames Bradley report anyway, and when I saw the Power of Information site, I jumped on it. The system is open-source and I’ve had a few conversations with Steph Gray the lead developer about other matters, so I was comfortable about giving it a try. And – with a bit of intervention from Steph – clearing up a few bugs – we got it up and running with all of the content added in a few days, and it’s being launched this morning at 9am. All of the examples of comment-blogs that I’ve seen have been done on techie subjects or with very metropolitan focus. This is different. It will be a first step into this kind of deliberation for many of the participants, and the subject is a particularly thorny one. All of the other consultations I’ve mentioned here can expect to be discussed with a fair degree of detachment. But the question of closing the wounds that were opened over thirty years in Northern Ireland is a different matter altogether. Keeping this conversation going in an effective and useful way will take the managers of this site into somewhat unchartered territory. The results will be interesting. Slugger O’Toole is a unique site. It has a huge reach in Northern Ireland that political bloggers elsewhere can barely comprehend. It also has a reputation for civility of a kind that is rare in the political blogosphere. Slugger sometimes erupts, and can often be quite combative – but nothing like as abrasive as Northern Ireland’s politics can be – and significantly more civilised than any other large-volume political blog that I’ve come across elsewhere. Slugger can bring the numbers – and the tone that is needed. All of the ingredients are there then. 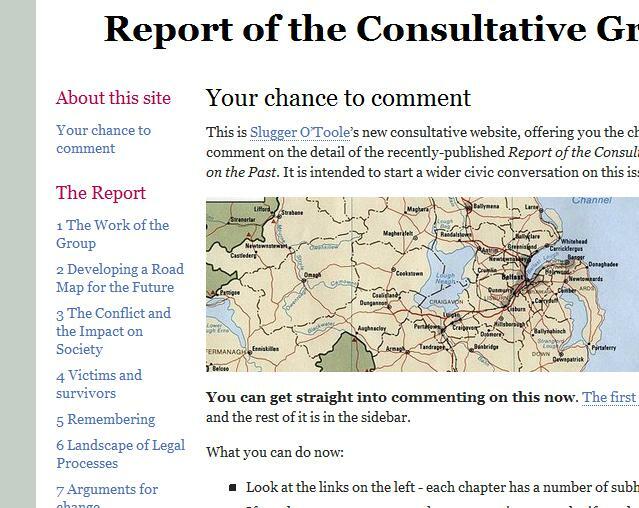 If any site can run an effective consultation on a highly controversial issue, Slugger O’Toole will do it. I’m hoping that we can learn a lot from this before applying it elsewhere. >It has a huge reach in Northern Ireland that political bloggers elsewhere can barely comprehend.